My home is Southern California but I currently reside in Nashville. Outside work, I expend energy on dogs and plants, in particular cacti and succulents. I focused on mammalian cells in grad school but now find few things as interesting as plants. 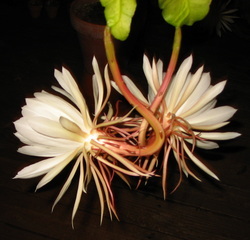 The night-blooming epiphyllum (right) moved with me from San Diego to LA to Nashville. If I knew how she judges when conditions are sufficient to bloom just ONCE a year for only 10 hours, I would be a happy camper. The natural world fascinates me, whether one's looking through a microscope, enjoying fall color at Nashville's Radnor Lake, or hiking in LA's San Gabriel Mountains. My favorite webcam is at Mt. Wilson, behind Pasadena. I check in almost every day to see how the light looks on those elephantine peaks. I didn't start out in science: my bachelor's degree, from UC Riverside, was in English. Nonetheless, I've spent my life working in labs, often talking late into the night with fellow scientists, who are some of the most interesting people in the world. In fact, I love writing profiles of scientists (some listed in Writing). Those "bios" require zero work, because vibrant people's stories tell themselves. As a grad student at UCSD and postdoc at Salk Institute, I wanted to know everything about how DNA gets transcribed into RNA, and I still find chromatin remodeling the most interesting field in molecular biology. But I want to know everything about whatever I'm writing about. Last week, it was how to rouse T helper cells to fight auto-immune disease. Next week it could be whether virtual reality games are destroying your hippocampus!